You are generous with praise, quick to smile, and always on the lookout for the positive in the situation. Some call you lighthearted. Others just wish that their glass were as full as yours seems to be. But either way, people want to be around you. Their world looks better around you because your enthusiasm is contagious. Lacking your energy and optimism, some find their world drab with repetition or, worse, heavy with pressure. You seem to find a way to lighten their spirit. You inject drama into every project. You celebrate every achievement. You find ways to make everything more exciting and more vital. Some cynics may reject your energy, but you are rarely dragged down. Your Positivity won't allow it. Somehow you can't quite escape your conviction that it is good to be alive, that work can be fun, and that no matter what the setbacks, one must never lose one's sense of humor. You tend to be more enthusiastic and energetic than most people. When others become discouraged or are reluctant to take risks, your attitude will provide the impetus to keep them moving. Over time, others will start to look to you for this "lift." Plan highlight activities for your colleagues. For example, find ways to turn small achievements into "events," or plan regular "celebrations" that others can look forward to, or capitalize on the year's holidays and festivals. Increase the recognition you give to others. Try to tailor it to each person's need. Explain that your enthusiasm is not simple naivety. You know that bad things can happen; you simply prefer to focus on the good things. Pessimists might superficially seem wiser; they might even sometimes be right -- but they are rarely achievers (and, incidentally, optimists have more fun). 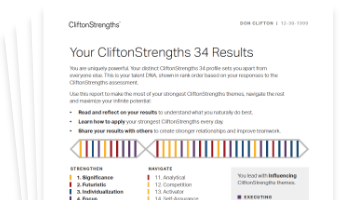 See how Positivity shows in your CliftonStrengths results -- discover All 34 CliftonStrengths Themes today!